Do you accept Out-of-State Insurances? 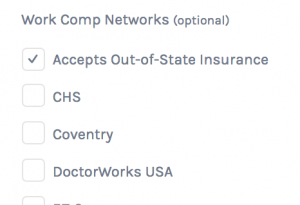 Do the doctors in your directory accept out-of-state insurances? Apparently, such doctors are in great demand. The clue is in the name, but let’s spell it out: Out-of-state insurance is when a patient’s insurance is from a different state. I have an employee who was injured in New York, but then moved to Florida. He is now looking for a doctor in Florida who accepts his New York insurance. It is taking me forever to call doctors’ offices to find one who does! Yes, I accept out-of-state insurance. How can I see more of these cases? 1. Ensure you have created a listing the Workers-Compensation-Doctors.com directory. Create your listing now. If you are creating a new listing, it will be possible to check the option “Accepts out-of-state insurance”. 2. If you already have a listing, you can Login to Update Your Listing. When updating your listing, you will see a list of Workers’ Compensation Insurances. Please check those that apply, including “Accepts Out-of-State Insurance”. Adjusters, Nurse Case Managers, Attorneys and Patients will then be able to perform filter searches to find doctors (such as you) who accept out-of-state insurances. Workers-Compensation-Doctors.com is the only national directory devoted to listing workers compensation doctors. Thousands of work comp adjusters, nurse case managers, attorneys, and patients use the directory to find their next work comp doctor. As a doctor, you can sign up for a basic (free) listing, or there are also paid plans which increase your chances of receiving more work comp referrals. Read more about Workers Compensation Marketing for Doctors.